Around the Table Book: What Would You Like on Your Table? How about a square Turkish table runner? If you've read this blog much, you know that I think that what's on our tables is important. A pretty table is a prepared table. I believe that, even though our families don't realize it, when the table is prepared, planned, and thought out, it helps them feel loved. At the end of September I will be giving away two of these lovely square Turkish Table runners that I picked up in the Grand Bazaar in Istanbul this summer. It will look great on your table between meals or at mealtime. These table runners feature the Turkish artistic rendition of a tulip on them. Did you know that the tulip was probably introduced to Europe from the Ottoman Empire? 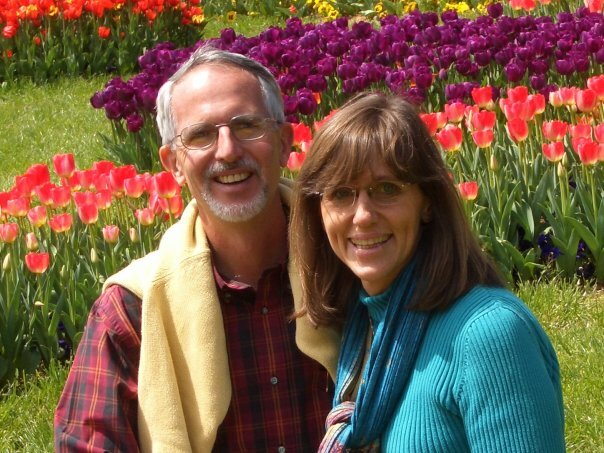 In 2008 Jim and I were fortunate enough to visit Istanbul at the height of tulip time. You and a friend could be the winners of these beautiful table runners! ... recommend someone to do the above. Both the new person whose name is randomly chosen and the person who recommends them will win one runner each! “Like” the Around the Table Book Facebook page AND write a comment on the page saying that you "liked" it and the name of the person who told you about page. Both the new member and the one who recommended them will win if their name is drawn. If you have already done these things, get friends to do steps 1 and 2 to enter and put YOUR name as the one who told them about it. Obviously, the more friends you get to list you as the one who referred them, the more possibilities you have of winning! Can I enter if I live outside the United States? Yes, IF you have a US address where I can send the table runner. I will send it to an address in the states and you can organize to get it from there. What if you told me about it, Sharon? If you heard about this from me and “liked” the page or became a member of the blog between August 29 and September 30, 2012, then find a friend who has not done this yet and tell them and you can put each other down as the one who told you. Why are you doing this, Sharon? I see my blog as a ministry to families, to help them find another way to connect with and encourage each other, but it’s only a ministry to as many families as actually know about and read the blog. So I want to get the word out to as many people as possible. Also God has given Jim and I the privilege and responsibility of traveling for ministry and I wanted to share just a bit of this with my readers to allow them to have something unique decorating their tables. So, don't procrastinate! "Like" the Around the Table Blog Facebook Page and become a "member" of this blog (you won't receive any emails) and write a comment telling me you did and the name of a friend who told you about it today! And then GTAF...Go Tell A Friend! Thanks, Dawn! I just edited the post as I see I didn't make it clear that the "liking" could begin today! Thank you so much for spreading the word and for liking my page! Thanks, Pam! I hope the site is an encouragement to you! New Follower. Lynne Batchelder sent me! Jessica, hope you'll find my ideas inspiring for connecting with others at mealtimes and will tell others about the blog! Great! I appreciate readers like you! If I inspire you, tell others, too! I just joined your blog and Sarah Poling sent me here. Thanks, Susan! I hope you keep reading and find encouraging ideas that inspire you to connect with your family and others at mealtimes! Thanks, Michelle, I've got you on my list of entrants for the giveaway! Tell some friends about the blog and the giveaway and get yourself entered more times!